To a newcomer, his first Christmas in New Mexico is often a little unreal. It isn’t that there are regional Christmas ghosts, or that the holiday is spooky. It’s just different, and differences may be unsettling. The manner in which Christmas is observed as an institution, or as a season, or a happy time, has become fairly standardized throughout the United States. Turkey stuffing in Florida is compounded of about the same ingredients as turkey stuffing in Oregon. A Maine Christmas tree is no less conical a conifer than a Michigan Christmas tree; and tinfoil icicles dangle with the same abandon. This unity of tradition is a sort of binding influence in American Christmases. The spinster aunt, spending the holidays with a married nephew two thousand miles away, knows that a familiar atmosphere will welcome her. The lonely traveler on the road on Christmas Eve knows that wherever he stops, there will be a holly wreath at the window of his motel cabin, and perhaps a cheering cup with the management. Will the spinster aunt, the lonely traveler, find these things in New Mexico? Of course. But they’ll find lots more, besides. The Spanish brought Christmas to New Mexico, more than 400 years ago, and a Christmas night here still rings faintly with the sound of long-stilled mission bells, with the voices of brown-robed friars chanting the Christmas litany in Latin slurred by the accents of Castille and Catalonia. If the first New Mexico Christmas seems a little exotic to the visitor, he should recall that few of his own Christmas customs were born in America. There is the turkey, of course; a native bird. But doesn’t he replace the noble roast goose of a British Christmas? And what about the tree, strung up with lights and spheres of glass? It’s an old custom of the German Dark Ages, rooted not in Christianity but the ritual of Druids. Santa Claus? A fourth-century Christian prelate, a European, the patron saint of children. His name is Saint Nicholas, and he resides currently at 90° North. Nothing American about reindeer, surely. They’re a semidomesticated animal of caribou tendencies, presently employed by the Lapps. And the wassail bowl? Plenty of good cheer there, without a doubt, but Beowulf had it first. The giving of gifts, the friendliness, the warmth and love associated with Christmas are, of course, universal. And binding all the traditions together is the incomparable story of the First Christmas. A New Mexico Christmas is always memorable. The land itself, for one thing, makes it so. Travelers from the biblical countries of Syria, Lebanon, Jordan, and Israel have gazed at New Mexico’s hills and valleys and villages and said, “How like home this is. How like my country.” Rural New Mexico has an unmistakable flavor of the Near East—soft, brown hills specked with tiny trees; terraced houses of clay that seem to grow from the earth; narrow roads that twist among farms and fields; the dry air; the clarity with which the stars shine. Under a robe of snow, and although snow seldom falls in the lands of the Bible, New Mexico looks . . . Christmasy. 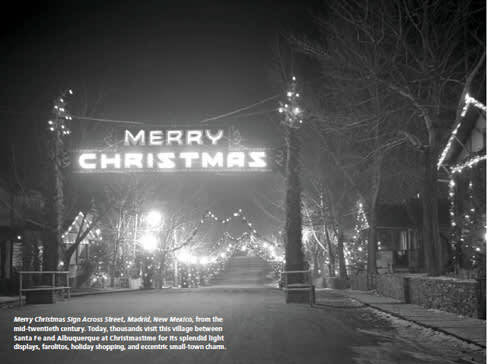 But more than the land, the people of New Mexico make Christmas live. And the customs of the season here are richer by whole civilizations, touched by other histories, brightened by traditions that are still maintained only in this corner of the American Southwest. With their Christian faith, the Spanish colonists who settled in New Mexico also brought their customs of Christmas, and planted them firmly in the lives of succeeding New Mexicans. Over the centuries, these customs have merged with those carried here with the pioneers who followed Kearny in 1846, the customs known throughout the United States. But the Spanish traditions have kept their form and flavor, and still grace New Mexico’s Christmastime. Some of the customs have mingled with those of the rest of the country; others are still separate and unique. Groups of carolers, stamping from house to house in the snow, may pipe a medley of “Adeste Fideles,” “Hark! The Herald Angels Sing,” and “Vamos Todos a Belén.” The last song named may be unfamiliar to ears attuned to “American” carols, but the Spanish words tell of a trip to Bethlehem, to see the Christ Child. In a home—any home—the piñata may replace the stockings over the fireplace. This is a practical change, and considerably more fun for most children, and there is something both hilarious and satisfying in taking a whack at the elusive piñata while you’re blindfolded. The humble piñon, as a substitute for the haughty fir, seems to belong in the corner of a low-ceilinged New Mexico home. It’s a homely tree, plump and asymmetrical. A comfortable and unpretentious old-show tree that looks particularly handsome with red chile peppers tied to its branches. A vast number of New Mexicans believe that candles, while a little dim, shed a friendlier light than electric lanterns, and so they fashion little lanterns. They fill grocery sacks half-full with sand, fold back the top an inch or so, and put a candle inside. They call them farolitos (or luminarias), and the visitor shouldn’t be surprised to see them ranged along the roof of the light-and-power company, as well as everywhere else. In regions of New Mexico where Spanish is still the commanding language, along the Río Grande and in the mountains and valleys in the north, the season lasts until January 6, Twelfth Night, with Christmas practices that would seem more familiar to Don Quixote than to most Americans. In tiny Mesilla, a village that cherishes its heritage of Mexican colonial days, there are nightly processions in the plaza recalling Mary and Joseph’s search for lodging. These are Las Posadas. The townspeople carry torches and go from house to house, knocking at doors, asking for shelter. In the villages where there are no scheduled processions, homeowners still build small bonfires of pitch-wood along the way. These are luminarias, to light the path of the Family who wandered about a strange city on a dark, holy night. In the misty years of colonial days in New Mexico, when not every village had a priest to say Christmas Mass, the people performed Nativity plays, folk dramas brought from Spain. The performance of these autos sacramentales is a custom slowly dissolving, much less common than in former days, perhaps soon to die altogether. The most popular of these folk dramas is Coloquios de los Pastores, about a group of shepherds preparing for the trip to Bethlehem. The authorship of Los Pastores is unknown, as is that of Los Tres Reyes Magos (The Three Wise Kings), another Christmas play of Spanish origin, which has been traced to the 12th century. The words of Gaspar, Melchor, and Baltazar still ring out after eight centuries of dramatic continuity as they discuss the gifts they bear: incienso, mirra, oro. The exotic qualities of a New Mexico Yule are even more evident in the Indian Pueblos, where Christian traditions dating from the Spanish conquest are merged with older tribal customs. On Christmas Eve in almost all the Pueblos, Midnight Mass in the mission church is followed by ceremonial dances. Flaming torches illuminate the shadowy Pueblos as the dancers move in graceful unison to the rhythm of the drum. Rifles are fired into the chilly December air, heralding the birth of the Child. These things are parts of a New Mexico Christmas, but not all. The happy traditions of the rest of the country hold forth just as vigorously here. There is snow and holly and mulled cider and an apple in the stocking. There’s nothing missing, but there are added elements that may be disquieting at first. New Mexicans delight in these regional touches, these exotic variations that set their holidays apart, just a bit, from the rest of the world.